The Final Release is available. New kernel same of Wary-5.1.1-01q-k2.6.32.28-small, without lang_pack. Download size 100MB. With all lang_pack. Download size 192MB. New kernel same of Wary-5.1.1-k2.6.32.28, without lang_pack. Download size 118MB. Same kernel of Wary-5.0-small, without lang_pack. Download size 101MB. the lang_pack's for German, Spanish, French, Hungarian, Italian, Japanese, Dutch, Polish, Portuguese and Russian are available but not contained in some .iso. For other languages, lang_pack_all supports 100 languages. Get the lang_pack here. Some additional driver and applications you can find here. devx for 511-01q-k.2.6.32.28 is wary_devx_511.sfs. The devx files may not liseted both on bootmanager nor sfs_load. In that case, right-click the SFS and select 'sfs_load'. NOTE: based on Wary-500-small, i18n based on LupQ-511, bugfix and updates along Wary-511. firstrun, pupsaveconfig, grub4dos, frugalinstaller, winfonts, puppy-desktop translation system, and etc. We all hope your happy new year and happy new Puppy! Posted: Fri 31 Dec 2010, 11:23 Post subject: What is deffernt? What is deffernt from the original? The multilingual wary-500m-- is based on Wary-500-small. Plus many bugfixes and updates taken from the wary-504, except the kernel and initrd. MIME binding for .asf, .ogv, .ra. (m06)Improved drive recognition. See the post. /etc.profile, GS_OPTIONS set to A4 paper for ghostscript. See the topic. (m06)UNetBootin, PXE(netwok) boot support. See the post. The .pot files of i18n scripts are at /usr/share/doc/nls. You can translate the help files at /usr/share/doc/help/C or /usr/share/doc/* and place the translations at /usr/share/doc/help/(language_code). Or the current collection of the .pot and .po here. We are calling for the ranslation of any language. Post the .po file as the reply of this topic. Description I18n　but　japanese　resource　only. having started from wary-500j02.iso I had to notice a strange behavior of xvesa: everything was staying in japanese. But switching to xorg vesa everything was as expected: osmo calender in german language and no need for legacy button in pupsaveconfig.. I am trying to make Russian langpack for Wary using your LupuQ ideas. Trying translate scripts using gettext. Here's what I got so far. One package uses built in i18n of Puppy and is kind of universal. It doesn't replace any binaries or scripts of the original. Another one is my scripts translated with gettext. I am also using some from LupuQ. We should implement your gettext'ed scripts in the wary. Hi, L18L. Thanks to your collaboration with us. As for the Xorg at the first desktop, changing the screen resolution on the fly with Xorg vesa driver is limited. We need to run the xorgwizard if we prefer larger resolution than 800x600. Isn't it wired? Uoops. Wrong owners for some directory in wary-500j02. PPLOG/DidWiki doesn't work on wary-500j02 unless these correction. I posted the solusion on the sound issue at the Wary feedback. Here is my .pot, (.po and .mo for russian) files and gettexted scripts and a new version of scripts pet. I tried wary-500j02.iso and I was mostly pleased by results. I noticed the following while using English keyboard layout. I didn't have this problem while using the Japanese keyboard layout. By the way this occurred in all programs, not just mtpaint. There was no problem saving the file to disk. Thanks don for the test. It is not the problem of keyboard layout but the locale. 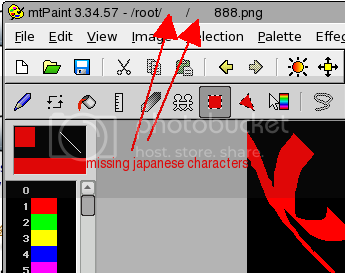 To display the japanese on the title bar requires Japanese locale, ja_JP.UTF-8, no matter the keyboard layout. It may be the specification of glib or gtk. I am refining the i18n scripts given by rodin.s. I will upload next version implemented those including pot files in couple of days. It saves to a default folder. It would take you a couple of seconds to do this work. It makes Wary a lot more convenient . to offer two buttons, one labeled 'Japanese' and the other 'English'. Click on 'English' and the regular 'FirstRun' app would run.